Yet despite the obvious layers of artifice, there is something insistent and revealing in these scenes [Corinne May Botz’s photographs of medical actors,the hired professionals who act out illnesses in order to train medical students in caring for patients]. In her 2014 essay “The Empathy Exams,” the writer Leslie Jamison explored her own experience working as a medical actor, and the complex negotiation and performance involved in expressing one’s own pain and in learning to respond to the pain of others. Úna Spain’s photographic study of St. Brigid’s psychiatric hospital, Ballinasloe, Co. Galway. 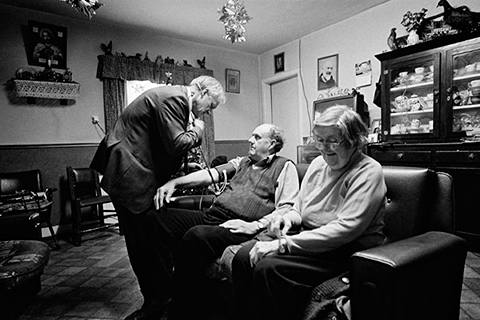 General Practice is a forthcoming exhibition of photographs at the Gallery of Photography in Temple Bar, Dublin, which highlights the vital role of GPs in contemporary Irish society, providing a glimpse into the usually private interactions between GP and patient. In colour and black-and-white photographs, the photographer Fionn McCann captures the trials, tribulations and sometimes humour of these encounters. The exhibition runs from 16 – 27 May 2012, admission free. There are 47 images in total and a video installation playing additional imagery. There is accompanying text for both the exhibition and the individual images. An introductory essay will be included in the accompanying catalogue.